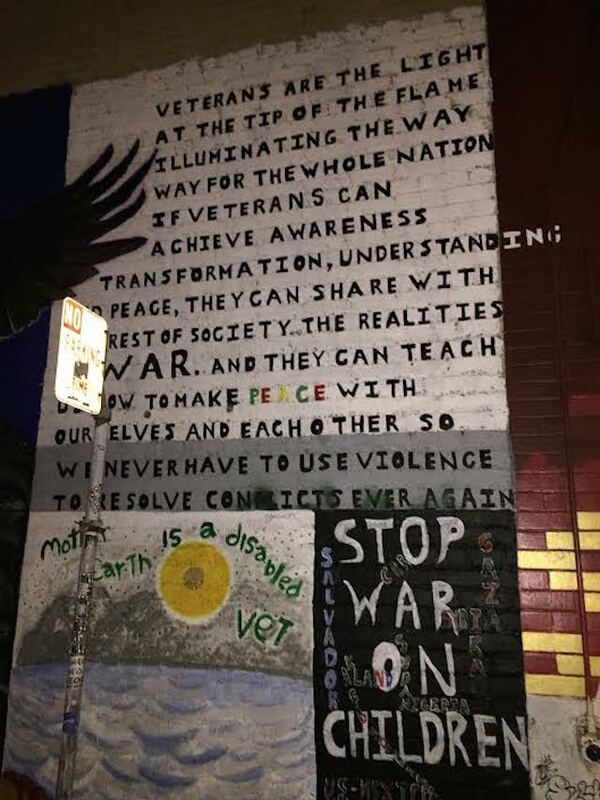 Correction: This article has been updated to reflect that fact that the San Francisco Veterans Mural Project (Veterans Alley) has housed several veterans both directly with property owners of Shannon Street/Veterans alley and through formerly homeless veterans as well as with the HUD-VASH program. From the War Memorial Opera house to the Presidio's National Cemetery, San Francisco pays homage to veterans in many ways. Among the most powerful: A small alley in San Francisco's Tenderloin neighborhood that runs between Post and O'Farrell north-south and sits between Taylor and Jones Streets to the east and west. Known formally as Shannon Street,it was unofficially renamed Veterans Alley in 2011 by Amos Gregory, a United States Navy Veteran and 16-year San Francisco resident. While less known to tourists than Clarion Alley in the Mission, like that walk of murals, Veterans Alley is a side street full of colorful, imperative personal and politic public artwork. The alley "allows US military veterans to paint their own stories on the public walls," Gregory wrote in El Tecolote last year. An activist for homeless veterans, a photographer, an artist, and a journalist, Gregory goes on to explain that "The project was created to give voice to the Tenderloin’s veteran population, which has long been oppressed, and suffered due to their veteran status, chronic homelessness and self-medication through drugs and alcohol." This Veterans Day, as restaurants are offering Veterans Day deals and National Parks open their gates for free, SFist spoke with Gregory to discuss his work and Vets Alley. 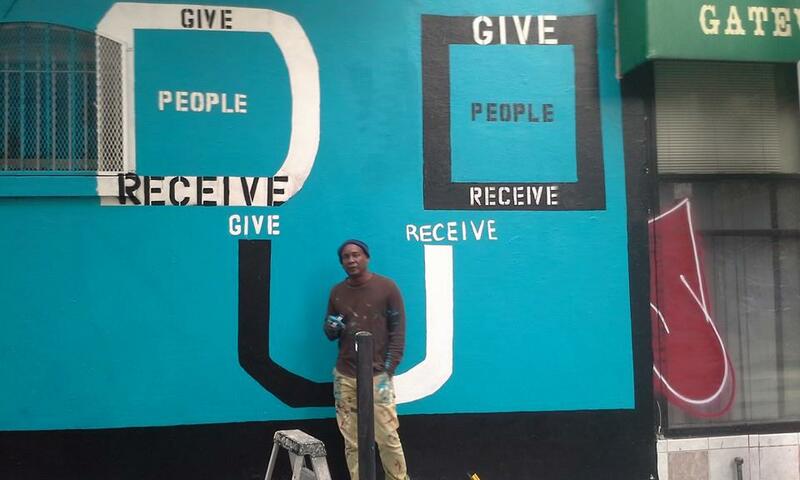 "Art is a meditation, the art we are doing," Gregory tells SFist. "The visual art, the photography, the painting. It requires an extreme amount of concentration. And the public nature of what we do takes a story that's embedded deep inside of someone — experiences that are years past — and puts them on a wall, a public wall that's publicly accessible. So, in the end, you've now taken this story and you've given it to the world." IN addition to guidance, The Veterans Mural Project/Veterans Alley provides paint, brushes to military veterans, their supporters, and the community. Gregory says the project is particularly useful for homeless veterans who come together and can, through working with him, seek services. "For quite a few homeless vets that we've housed, through the project, this is our first interaction with them. This is a way to engage with them, gain their trust, get their story out, and then, through the process, to hand them off to other services. We're not equipped to do everything to help them, but what we can do is to be that first lynchpin, to provide that first step of healing, and to direct them to more people who can help." Gregory explains that the project has helped house veterans directly through the VA and local property owners but does not receive city support for more. So far, it has housed several veterans both directly with property owners of Shannon Street/Veterans alley and through formerly homeless veterans as well as with the HUD-VASH program. In April of 2015, Mayor Lee indicated that all homeless veterans living in San Francisco were on track to be in stable housing by that year's end, as CBS 5 wrote at the time. “No one who has served our country should be homeless in our city," the mayor reportedly said. "He failed," Gregory tells SFist. "The City of San Francisco failed. The number that they're using for veterans, first of all, is a lowball number, and they haven't been updating that number because they keep trying to hit their goal. As you know, homeless people come to this city all the time. I've got a few new Afghanistan vets that just landed here, and they're homeless." Gregory is proud of the radical inclusivity espoused at Veterans Alley. "Our program has not discriminated against anyone. I've had right-wing vets help me paint Bowe Bergdahl and then you've got left-wing vets painting Chelsea Manning right across the street, less than 50 feet away. We're all just vets, we're the most demographically diverse group in America today." Amos Gregory beside a mural. Asked about California's move to legalize marijuana, of which Gregory is a proponent for its medical uses among veterans, he seems cautiously optimistic. "That's the first step for us, but it's still a federal crime, and we're subject to the VA, so we're going through the federal government. There's a lot of restrictions on us getting medicinal marijuana, and that's one of the things we're advocating for." Gregory cites one mural he's created in Vets Alley that pictures drones dropping pills as bombs. "The pills falling all around us represent the overprescription of opiates and antipsychotics to veterans," he explains, "particularly the antipsychotics can be related to a high incidence of suicide. The opiate treatment, the methadone treatment that many go through with the VA, when I was working on the mural, I was working with three vets who were going through that. This was part of their therapy for those things. They're hooked on opiates, but they don't have any help to get off them, or to relieve the chronic pain or anxiety that they have. Then there's there's penalization for marijuana use: If you're in a program where you get caught with marijuana in your urine, you could lose all your meds and housing, so it's very restrictive for us, it's a catch 22. The VA is coming around, but slowly." Gregory is also a founder of The Syrian Refugee Mural Project. 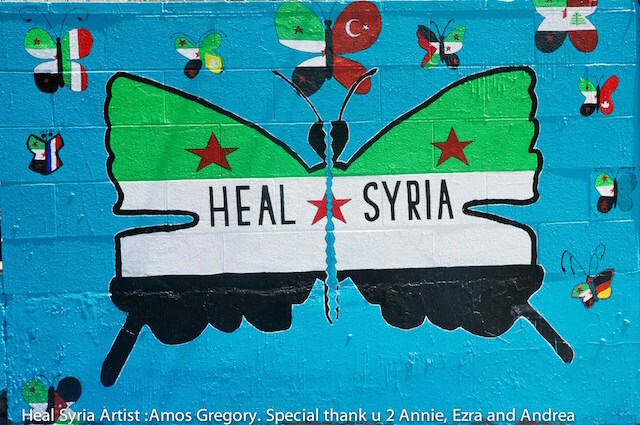 "We began our project in 2013 by creating artwork (public murals) for Syrian children in San Francisco... to raise awareness of their plight," He explains of that project. 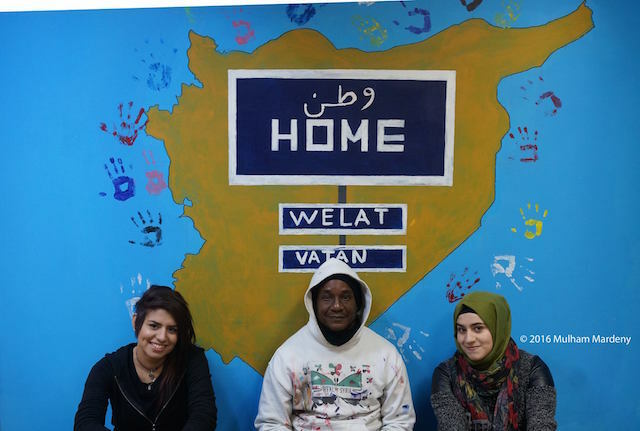 "We started directly working with Syrian children in their schools located in Antakya, and Istanbul Turkey, in 2015 and 2016... We partner with the Turkish Ministry of Education, Syrian non-profit (NGO) organizations and schools servicing Syrian refugee children." 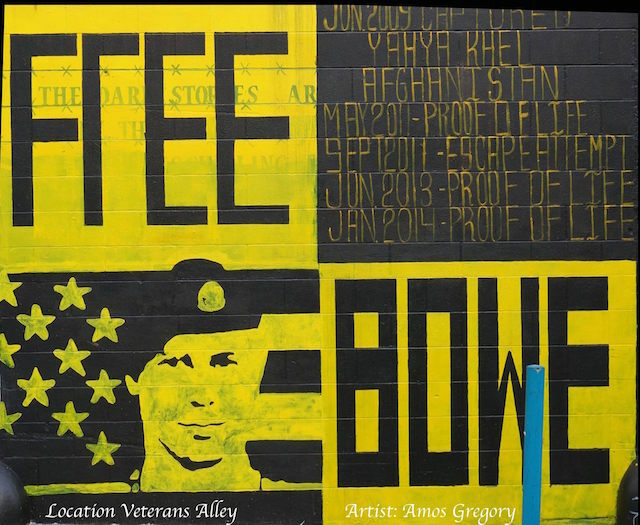 Vets Alley and the Syrian Refugee Mural Project accept donations online, and you can also sign up to volunteer with Gregory.